It is hard not to look back to the history of printing, see how far we have come, and what the purpose of printing technology has done for society. It all started as the necessity of sharing information and passing knowledge to others. Even though the first printing process started back in the form of woodblocks used in China for printing on textiles and paper, it was a way to reproduce information for the masses and fairly fast. Not only was it a way to share information, but also to make art and design attainable by everyone. A 3D printed cast. Image from http://jakevilldesign.dunked.com/cortex. The technology of modern day printing has changed so much in the last few decades—without these advances cool things like the custom 3D cast pictured above may have never happened. A Victoria University of Wellington grad student, Jake Evill is pushing the boundaries of couture casts with his Cortex cast. Each cast can be customized and fitted for the patient—based upon the injury, X-rays taken, and a 3D scan of the surrounding limb. These casts are not only lightweight and airy, but they are designed to be able to be removable, worn with clothes, and be shower-friendly. No more gross, stinky plaster or fiberglass casts. Granted, this thing may take a while to print—24 to 72 hours to fully set—but we at least have these possibilities. Advancements in printing have even enabled people to even get their face—and life—back. According to an article in the Sydney Morning Herald, restaurant manager Eric Moger had lost a third of his face to an aggressive tumor that was growing underneath the skin on his face. Now he has had an opportunity to get his face back through advancements in printing technology. By taking scans of what was left of his skull and using computers to recreate the other side of his face using nylon plastic, Moger is now able to drink water without having liquid running out of one side of his face. The social value of printing has a positive impact on people’s lives; it is amazing to think that in the near future, printing could function on a cellular level, printing real skin or even body parts. 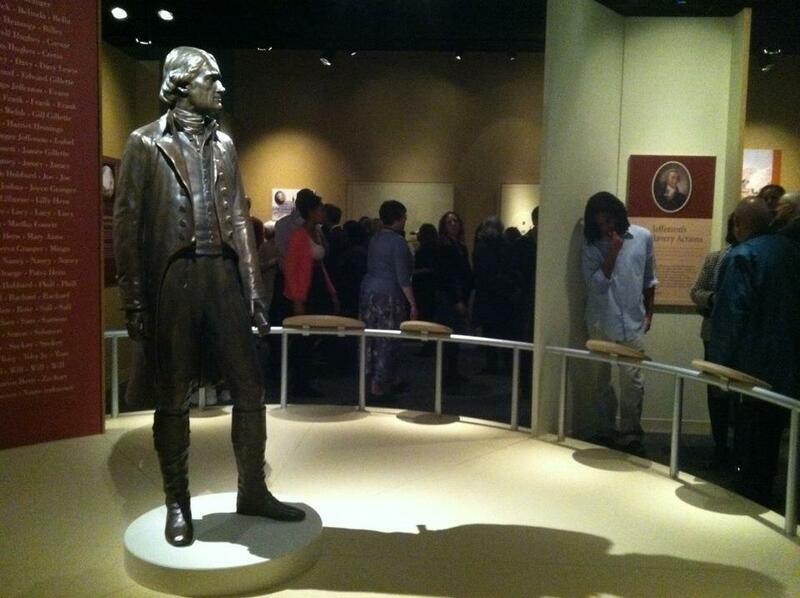 A life-size 3D print of Thomas Jefferson on exhibit at The National Museum of African American History and Culture (temporarily located at The National Museum of American History. This exhibit is now closed). Photo via Smithsonian 3D Digitization Facebook page, photo by C. Thome. Even the Smithsonian has jumped on the 3D printing bandwagon. Printing advancements have enabled the cloning and sharing of pieces with other museums around the world. Thanks to Redeye, a company that specializes on 3D printing and rapid reproduction, the Smithsonian was able to recreate a large 3D reproduction-quality historical replica statue of Thomas Jefferson. The team here at the Lemelson Center is even thinking about the implications 3D printing might have in our revamped Spark!Lab (opening 2015). Three-dimensional printing has rightly been referred to as a “disruptive technology,” and I, for one, am greatly intrigued to further explore the opportunities and challenges of this new technology. These days we can get custom dental braces, custom T-shirts, custom iPhone covers, and more. What’s next?